This skill is dreadfully important during an east coast low. Practising this skill will also assist when passing buses splash mud all over small children. Just laugh and remind them of their hero Peppa Pig’s affection for mud and how lucky they are to have it splattered on their faces. Hilariously, at the end of many episodes, Peppa, George and their friends and family, end up lying, cockroach-like, on their backs, giggling hysterically. Can anything beat rolling on the floor, laughing? I don’t think so. ROFL beats LOL. Never, since Chitty Chitty Bang Bang, have we seen such effective transformative transportation. Plus, skull and crossbones. Pirates = cool. Irony: In my favourite episode, which is my favourite episode because I’m a great big greenie, the Pig family go camping, and Daddy Pig pulls out a TV so he can watch a nature documentary about a bird. He shoos an actual, real bird (that’s shoos, not shoots) who perches atop the TV, as it is interrupting his view of the birdy nature onscreen. Later, at the insistence of the eternally-clever Mummy Pig, he realises the error of his ways, turns off the TV and enjoys a picnic at the highly-entertaining “Duck Land”. I’m not sure that the kids get the irony, but they do understand that jumping in muddy puddles is hilarious. I couldn’t get Google to cough up a picture of this, sorry. Hilarious jokes at Daddy’s expense: Daddy’s big fat tummy and smelly socks are particular standouts. Fun for mums everywhere. Here, Daddy’s big fat tummy prevents him from entering the cubby house. In an amusing twist, the secret code words to gain entry to the cubby house are, “Daddy’s big fat tummy”. Well, it’s either that or, “Daddy’s smelly socks”. It’s something derogatory about Daddy. 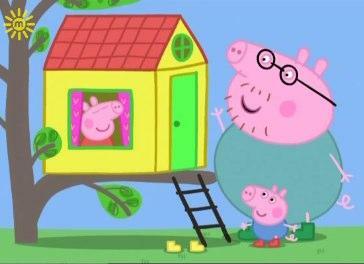 Luckily, Daddy Pig doesn’t mind a joke at his own expense. Daddy Pig is a good sport. A big, oafish, clumsy good sport. Hilarious. This is the piece de resistance. Perfection in 300 seconds. Oh, I found the Camping Holiday episode! It’s 300 seconds well-spent, I guarantee. The process: grab their attention with simply drawn characters and primary colours, make them laugh at funny British accents and highly entertaining jokes about being fat and smelly, jump in muddy puddles, fall about guffawing, and present a subtle, yet important, message, such as “don’t take a leaky boat out to sea”, or “you can’t always trust a GPS”, or “if you miss the school bus your teacher will drive you”, or “overdue library books are funny”, or “gazelles are French, because ‘gazelle’ seems like a French word”, or “steep hills are no match for a pig-powered tandem bike”, or “potatoes are funniest if they speak with a Spanish accent”. Clearly, I’m well versed. When the closing credits roll (cue the glockenspiel), they’re screaming for more. Ah, iView, I salute you. Thanks, Peppa Pig. You saved my bacon! Do you have a favourite ‘Peppa Pig’ episode? Or is ‘Olivia’ more your style of pork? Want more Top 5? Check out my Top 5 Dance Movies (more watermelon, less ham, but with a dash of Kevin Bacon). Linking up with the always-hilarious Slapdash Mama for this week’s Lounge challenge. Code word: bacon. And flogging my blog on Friday with Grace: http://www.withsomegrace.com. Hi Lisa, we totally love Peppa Pig in our house, too – even the 8 year old still enjoys it. Ever noticed how the Pig family are vegetarians without actually saying so (well it would be a bit awkward for them to be eating beef, lamb, and god forbid – pork, wouldn’t it? ), so they eat corn on the cob, pancakes and vegetable soup. Go Peppa! Oooh I never noticed about them being vegos! I guess they won’t be chowing down on bacon and eggs, haha! But Grampa Pig has chickens? My kids love Peppa Pig – and 4 year old seems to have learnt a lot from it – including “I think you should take the STABILISERS off my bike?” WTW????? Haha my 5yr old said the exact same thing! Stabilisers – yeah my kids were like, “Mummy, what are stabilisers?” They do learn stuff, though – hilarious stuff! Agreed. Ooooh yeah, Grampy Rabbit! Poetry! Love Peppa Pig so much. Did you ever see Elves & Fairies made by the same peeps? Fantastic stuff. I always love “Grandpa Dog is Grandaddy Pig’s Best Friend”. I saw a blog the other day over analysing toddler TV way too much! You have restored my faith in parent’s ability to see some fun in these things. No! I must find Elves and Fairies, if that is the case! Oh god, analysing toddler tv!? Next up, my Marxist reading of ‘In the Night Garden’! Haha! This lady had a problem with Charlie and Lola teaching kids poor speech patterns. I had to sit on my hands so hard in order not to post a comment telling her she was a freak. Head butted the keyboard in order to click away from her site! LOL! Yes that Peppa Pig episode is my favourite too! I had a real giggle when he was watching the TV and turned his car into a boat. My kid’s love peppa pig more than any others – now I know why! It’s the song, too! I forgot to mention the song!!! I love Peppa Pig as much as my kids, for all reasons stated above. Except for the degradation of males. I think that it is an unfortunate trend in television to mock the Dad’s, and although men often do leave themselves open to this, it’s not entirely healthy. Having said that, I’m glad Daddy Pig demonstrates how to not take criticism too seriously and beautifully illustrates how to laugh at oneself! I LOVE Peppa Pig. It’s one of my favourite shows. I mean, my girls’ favourites. Obviously. I struggle not to laugh every time they ROFL at the end, no matter how many times I (we) see it. We may have even re-enacted it. Or not. Of course not. That would be embarrassing. Man, re-enacting the ROFL, that sounds like fun. In a tiara? Even better! Just don’t tell the kids bacon is made of Peppa Pig… that might be a little, well, unsettling? Haha! We are massive Peppa Pig fans in our house! I like Olivia too, but she ain’t got nothing on Peppa. My fave ep would have to be when they are going for a picnic and have to take a boat across the lake. Daddy pig gets stuck with Mr Wolf who says with a suggestive look on his face, ‘I’m getting very hungry’. I also love yesterday’s countries of the world ep. Madame Gazelle is sitting inside strumming her guitar singing peace and harmony through all the world when she can hear the kids fighting. “Oh no the countries of the world are fighting,’ she says. Love it! Oh, I don’t think I’ve seen the hungry wolf one!!!! Shame!!!! How can I call myself a PP expert? (Did I do that?) Oh, yes, I love Madame Gazelle. The whole back story that she taught Daddy Pig… Man, she is really old. But yes, that episode is pure genius! I freaking love this show. Like it is ACTUALLY one of my OWN favourite shows. The one where the French pen pal comes to a visit. HILARIOUS! The one where Daddy Pig does the fun run to raise money! SIDE SPLITTING! Anyone who doesn’t enjoy Peppa Pig has tired of life. Definitely. Peppa is a GOD to me. A God. Damn!! I should have called my post “Top five reasons why Peppa Pig is GOD” – oh well, next time. That’s gold. Peppa rules our screens here too. I do love it, but I wish they’d make a few new episodes. We do seem to have had our holiday in Italy about 3000 times now! I laugh when they fall about laughing on their backs – every time! Still funny. I think they’re quite a joyous family despite leaky boats and other daily dilemmas. Oh yes, but for some reason the kids will just watch those same episodes over and over and still sit there giggling! We had one particular afternoon where we had the watch the same episode back to back at least five times. Kids are weird. Smug. That is spot on for Olivia. That song at the end! Got nothing on shoddy animation and muddy puddles, does she? The opening music is bewitching. If DS hears that song his life is put on hold as he races to the telly for a hit of the Peppa drug. Of course, Jodi! I didn’t mention the music. You are so, so right. They just have mind control down pat, don’t they? Peppa is very, very popular in our household, as I suspect she is in many. I could not imagine the number of times she has been cake for birthdays either! I have never seen a Peppa cake! Obviously I haven’t lived. I would have suggested one for my kids, but that seems a bit hard. 😉 There’s just something about Peppa! I love Peppa for all of the reasons you mentioned and more. I enjoy watching the show where many kids shows I can barely tolerate. I still need to work out how to put a series of episodes on at once, so I don’t have to keep selecting the next one on iView… If anyone knows how to do that, let me know! Peppa is big on Twitter? Go figure! Oh, you should watch. Very clever stuff. And 300 seconds, right? Can’t beat it. I love Peppa Pig, we have a book that you hit the buttons on when there are certain pictures in the book, every kids loves it so much that the thing is now stuck together with sticky tape. 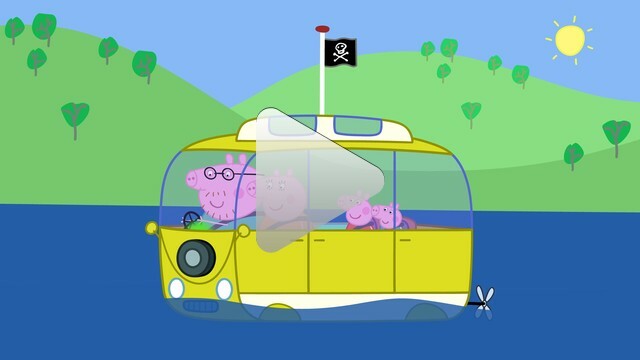 The only problem with Peppa Pig is the episodes being so short – I need a Peppa THe MOVIE to come out! Oh, to get my hands on that book! Haha! We LOVE Peppa Pig in our house! Oh you MUST! Haha. I think I used the word “hilarious” around fifteen times in this post. There is just no other word! Ah Peppa I still love it alas my two say they are too old for her now….Im not and I still love Charlie and Lola as well. Just a big kid at heart thanks for the memories. ‘Tis good to be a kid at heart. Today hubby and I were talking about Miss Rabbit and the running joke that the writers have in making her do every job under the sun. Too funny! Oh, the twinlets LOVE Peppa Pig! I love how ABC4Kids plays 3 or 4 episodes in a row. It’s like watching a DVD and not having to touch the replay button on the remote! Clearly ABC4Kids know their stuff! Haha! Peppy is massive in our house too! Muddy puddle fun reigns supreme! I love the episode where they go on a seaside holiday & it’s snowing – even at the beach!! The songs get in your head! My partner will often use the, “I am a bit of an expert at these things!” (Daddy pig classic!). Just saw the one where Grandpa Pig gets a computer today. Too much fun! Oh yeah, the cold beach one is good – the mums go swimming, crazy women! lol. 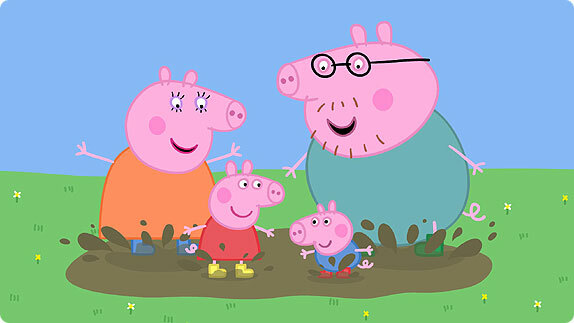 We love Peppa Pig here (so does mummy) Right now the song is in my head (arrgghh). I too love the camping episode but there are so many great ones. I love. Don’t know what I’d do without ABC2 sometimes (I know that sounds bad but it’s my saviour for 20 minutes when I need it). ABC2 is awesome! No ads, and good kids’ TV. I love how they alternate Peppa Pig episodes with their other shows of an evening. Obviously there is just something about Peppa that everyone loves! I used to watch Peppa Pig without my kids. Loved it! I’m impressed you have a favourite episode of Peppa Pig. When Peppa Pig comes on I take the opportunity to get something done in the 5 minutes as I know my son will be glued to the TV and not ask for a thing. Haha, mostly I’m half listening whilst trying to get things done, but I think after they’ve played on repeat so many times, they have seeped into my mind. That said, when I do watch I enjoy it. It really is very clever. Yes! I need to work out how to play them consecutively. I love that they’re short and keep the kids’ attention, but I agree, I’m pretty sure that they would pay attention for hours. My daughter is obsessed. It’s a little scary. Who knew that we all felt so strongly about Peppa Pig!! I couldn’t get dinner started without Peppa Pig screening when it does, and the hypnotic effect it immediatley has on both boys (2 and 5) who I frequently see both standing still and staring at the TV when it is on…. zombied. But we all enjoy it, the humour is priceless and the way they solve problems in each episode… we sing Bing Bong Bingly Bongly Boo and refer to each other as a Clever Clogs periodically too. I just wish ABC2 could have a Peppa Pig hour every weeknight just so I could get dinner on and have time to sit and giggle with the boys too. I am just in awe of the makers of Peppa Pig. They are certainly on to something! I think I love it more than the kids, and they are obsessed! Hee heeeeee. I am 100% Peppa Pig converted – it is awesome! to the extent that I put it on for Pumpkin then she goes wandering off and I am left watching it on my own – and I do, I just keep on watching! Me too!!!!! I am nearly to the point where I’m going to start watching it by myself. And quoting from it for laughs… Oh hang on, I may just already do that!